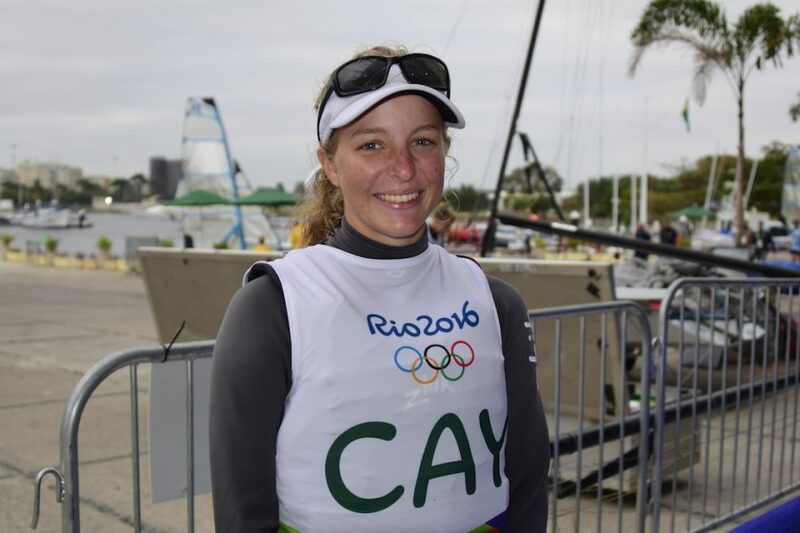 Florence Allan, aged 18 years old, talks about how it felt to represent the Cayman Islands at the Rio 2016 Olympics! I started sailing when I was 7 through the summer camps at my local club. I didn’t get into competitive sailing until 2011. I have been Laser sailing for 2 years now. I have been sailing 3-4 days a week and on the other days I was in the gym. There are 5 Laser sailors (including me) on the youth sailing team that are my training partners and competition. How is sailing in The Caymans? The North Sound that I sail in is quite shallow, so the wave height is never very substantial (which made sailing in the open ocean course in Rio quite challenging!). Winds in Cayman can range anywhere from 1 knot to 25 knots depending on the time of year, so we have a variety of wind conditions. There is very little tidal range or current in the North Sound that I sail in – so it was a lot to adjust to in Rio. Tell us about the day you found out you were going to the Olympics? The club manager of the Cayman Islands Sailing Club phoned my Dad with the news and my Dad told me in person straight after. It was the same day I had my first A-Level exam so I was studying when I found out! I burst into tears straight away because I was so overwhelmed! It was just getting everything you’ve ever wanted in your entire life all at once, so it was a very special experience. But it was also difficult to train as much as I would have liked to, being in the thick of my exams. Were you more nervous or excited about attending The Olympic Games? Initially I was very excited to compete, but as we got closer and closer to leaving the Island and starting the regatta, I got very nervous! I was the most nervous about people watching all my races on TV, because I had never been filmed like that before. Luckily the nerves subsided just before the regatta started and I was excited and enjoying the whole event. The Cayman Islands Olympic Committee helped me tremendously with sponsorship, support and help for training trips and for the games to Rio and flights etc. I was also sponsored by some local companies, such as Richard Flowers of Flowers Bottled Water, Mike Farrington of Compass Marine, David Carmichael and Frank Atkinson. My parents have also been a huge support. One person that must not be forgotten is my brilliant coach, Raphael Harvey. He has been with me every step of the way. I am very grateful and thankful to him for his support. The Cayman Islands Sailing Club have also been very supportive. What was the atmosphere like in Rio? It was an incredible atmosphere, and I don’t really know how to put it into words. There was such a positive vibe and atmosphere. Everyone was so happy and excited to be there and compete. It was definitely different from any regatta I’ve been to before. What were the sailing conditions like? I wasn’t expecting as much wind and being the lightest sailor at the Games I struggled quite a bit in some wind conditions. Also, I’m not used to sailing in tide/current and the waves in the open ocean course proved to be quite difficult to adjust to. It was obviously the most difficult regatta I’ve ever competed in due to the level of competition as everyone was much more aggressive. It has taken a lot of work, on and off the water, and a lot of sacrifice. But all the nights that I didn’t go out and all the beach days that I missed meant so little as soon as I walked out in that Stadium at the Opening Ceremony! All the work that I put in was worthwhile when I saw the Cayman Islands flag on my sail! Are you now a celebrity in the Caymans? I wouldn’t consider myself a celebrity back home, but I hope that I can inspire people to dream and achieve big things. I hope that our whole Olympic Team was able to show other people in Cayman that it doesn’t matter that we’re a small country and not recognised on the international stage – we can still achieve big things! How have family and friends reacted? My friends and family have been incredibly supportive of me and my sailing. I honestly couldn’t have asked for a better support system. I have just started studying at the University of Exeter, doing Politics, Philosophy and Economics. Hopefully soon I will start sailing a double handed boat with Pablo Bertran who is on my sailing team in the Cayman Islands and whom I sailed with at the Youth Olympic Games in China, 2014. I would also like to start sailing with my University team and do team racing with them. There’s a lot of people I respect in our sport; however, I definitely look up to Cy Thompson from the U.S. Virgin Islands. He’s proved to me that people from the Caribbean can still become very good sailors who are well recognised internationally!